Just as delicious as the store-bought kinds but made without the corn syrup and trans fats, these healthy Homemade Nutter Butters will blow your mind! One bite and you’ll be hooked. You’ll wonder how (and why) Nutter Butters are still on the grocery store shelves. This homemade version is both salty and sweet, chewy with a slight crunch, and incredibly addictive. You cannot (and will not) stop at one. Let me repeat: you will not. stop. at. one. 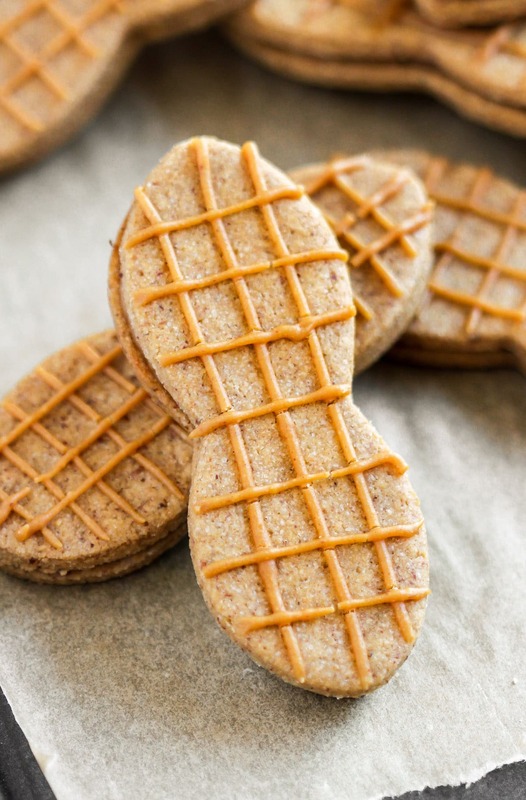 Just as delicious as the storebought kinds but made without the corn syrup and trans fats, these healthy Homemade Nutter Butters will blow your mind! This DIY recipe is sugar free, high protein, gluten free, dairy free, and vegan too! In a stand mixer bowl fitted with a beater attachment, add the flax and water. Mix on low speed for a few seconds, then turn the mixer off. Add the peanut butter and vanilla extract and return to low speed. When fully incorporated, add in the erythritol. While that mixes, prepare the dry ingredients. In a large bowl, whisk together the oat flour, peanut flour, baking powder, and salt. Add the dry ingredients to the stand mixer and mix until it forms a cohesive dough. While the first tray bakes, roll out another ¼ of the dough (if you don't have another Silpat, you can use a sheet of parchment paper instead). Repeat until all of the dough is used up. 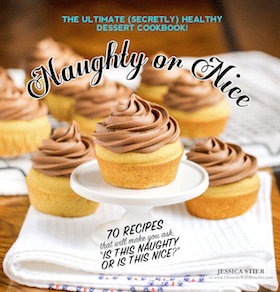 In a medium-sized bowl, whisk together the peanut flour, water, and stevia extract. When smooth, whisk in the peanut butter. Scoop the mixture into a piping bag fitted with a small round tip. Flip half of the completely cooled wafers. Pipe the icing, outlining wafers first, then fill it with more icing. Place another wafer onto the iced wafer and gently press it together. Ice the tops of the sandwiched cookies. Serve and enjoy! These Homemade Nutter Butters are better than store-bought, not only because they are homemade, but because they are good for you! They are filled with protein, thanks to the peanut flour, peanut butter, and oats, and contain healthy fats and zero added sugar. Ew, ew, ew. Bleached flour, white sugar, hydrogenated oil (aka trans fats), high fructose corn syrup… oh my goodness. WHY didn’t I flip over the package and read the ingredient list when I was younger and used to eat these all the time?? Ah, with these in sight, who needs those highly processed prepackaged ones?? I had never heard of these before (grew up in Belgium, we had Speculoos, not Nutter Butters!) but OMG THEY LOOK FAB. I wouldn’t eat them if they were made with all those disgusting ingredients you listed but your version? Simply mouth-watering. Nutter Butters were one of my favorite cookies as a kid. This is brilliant!! These are GORGEOUS-and I bet they taste like a bjillion times better than storebought! They look perfect! I love Nutter Butters but don’t think I’d have the skill to do all this work…love them. Trust me Angela, I have NO baking skills and pulled these off. If I can do it, you can do it! Yes please! These look and sound amazing. You can use any milk you like, I just used coconut milk because it was all I had on hand that day. Almond milk would be great in these 🙂 I hope you like the recipe! I have been to every whole foods, natural grocery, regular grocery, health store, farmer’s market, and even specialty stores in my area and I cannot find peanut flour anywhere! Then a thought hit me and I wondered “Could I use PB2 in place of the peanut flour until I get my order of peanut flour off amazon shipped to me?” I’m in a time crunch and thought it could work but I haven’t tried it yet. What do you think? Ooooh. Living in Ireland, I’ve lived my life nutter butter free!! I wonder what they’re like… I want to try making these nowww!! 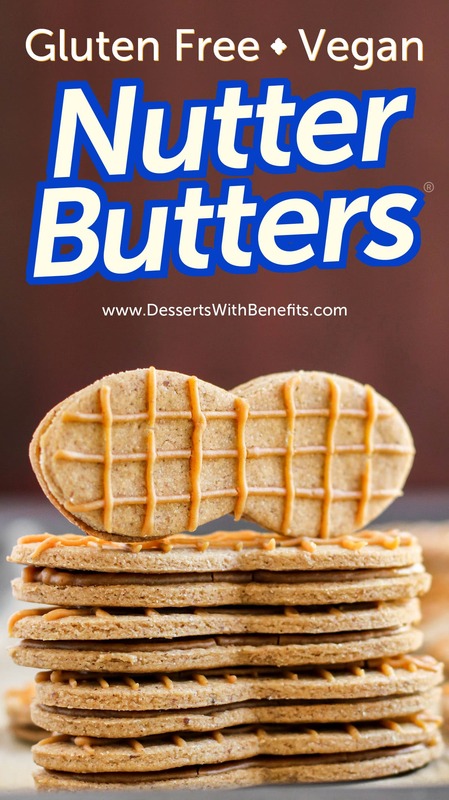 Quick qs – can you use your “Double peanut butter” in any of your recipes? I made that today – love that its so peanuty and still low calorie!! Love your stuff so much! the pumpkin pie syrup is AAAAAAAAAAAMAZING. I wouldn’t recommend using my Double Peanut Butter in any baked recipes, but for no-bake recipes, it should work just fine! I hope you like the Healthy Nutter Butters! PS: YAY I’m so glad you like the Pumpkin Spice Syrup!! Just letting you know i made them this morning 🙂 And i used normal PB in the recipe, and in the frosting recipe i DID use your double peanut butter and it worked NO PROBLEM! I dont have that protein poweder but i did have a different brand vanilla protein powder – worked grand just turned the frosting GREEN!! I also used a low fat butter and it worked no problem. Your recipes are always absolutely perfect – amazing. Never cease to impress me, lady! Please please pleaseeeee make another chocolate cookie (like the oreos!) recipe soon – i LOVE cocoa powder, cant get enough of the stuff! YAY I’m so happy you liked the Oreos too! Brown rice protein powder takes a little getting used to… lots of trial and error needed! It needs a ton of other stuff with it to avoid that chalky texture. I’m glad adding it to smoothies helped! I finally got around to buying peanut flour online! 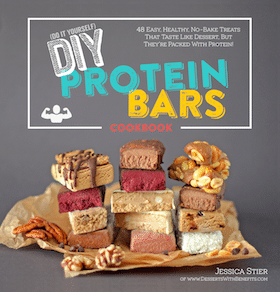 I am ready to make these this weekend, but saw that the recipe calls for 2 scoops of brown rice protein powder. How many tbsp is that equal to? Thank you! So excited about making these!!! 2 scoops of the brown rice protein powder should be roughly 5 tbs. I would recommend using a kitchen scale for this recipe though, brown rice protein and peanut flour pack pretty easily into measuring cups and can result in a different outcome. Anyways, I hope you like the recipe!! Awesome! I loved these as a kid. Can’t wait to try the recipe! These look delicious. I’ll have to find something to sub for rice flour though as I’m sticking to a low-carb diet. Almond flour may have to suffice. Can’t wait to try them! Just tried these and they are delicious. Thank you very much for the recipe. I have been wanting to make nutter butter since I can’t get them in Canada. The cookies didn’t come out crunchy though. Any tips on how to get it crunchy? 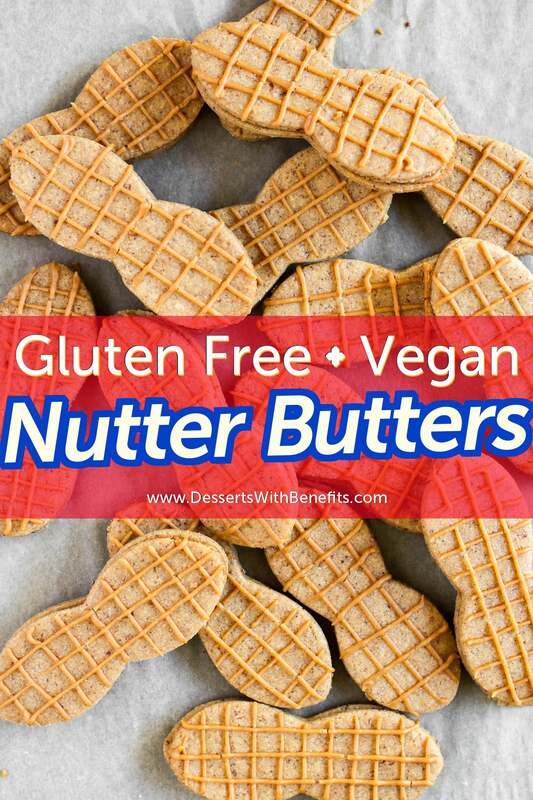 Fun fact, I never knew that Nutter Butters were accidentally vegan until this year. Something in my mind always believed they’d have milk or egg in them. BOY am I THRILLED they don’t! I seriously love these cookies. Even more so, I love that you created a healthy take on them–now I can enjoy them more often with more nutrient-dense foods! Peanut flour is an ingredient I have to purchase anyways. I’m obsessed with it in its entirety! 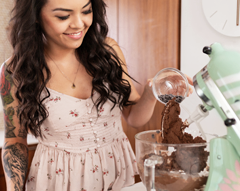 Fantastic to work with in smoothies and in baking, of course! I honestly didn’t realize they were vegan either! 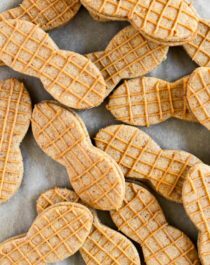 I’m glad you appreciate the peanut flour recipes 🙂 And I hope you get to try this recipe! !